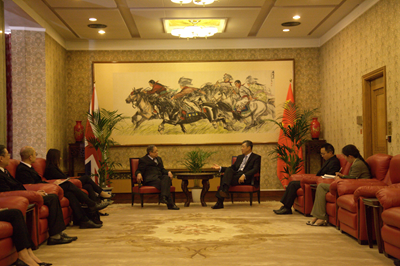 On 29 November, the Chinese Ambassador to the UK H.E. 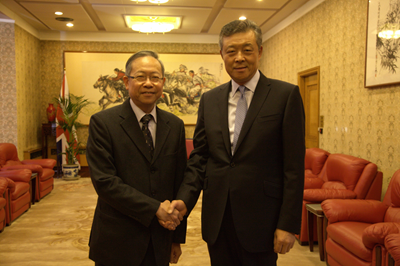 Liu Xiaoming met with Secretary for Security of the Hong Kong SAR Government Lai Tung-kwok at the Embassy during the latter's visit to the UK. Ambassador Liu said that the Central Government has been firm in its determination and position to implement the policy of "one country, two systems" and to safeguard Hong Kong's stability and prosperity. Recently, President Xi Jinping met with Chief Executive Leung Chun-ying during the APEC Informal Leaders' Meeting. He asked Leung to lead the SAR Government to build broad social consensus, to focus on boosting economic development and improving the people's well-being, to safeguard national unity, and to maintain social and political stability. Stability is the basis for prosperity, Ambassador Liu stressed. He expressed his confidence that the Security Bureau of the SAR Government would live up to the important task of safeguarding the public order and ensuring the social stability in Hong Kong. Ambassador Liu pointed out that this year marked the beginning of the "Golden Era" of China-UK relations, and the comprehensive and pragmatic cooperation between the two countries had been continuously deepened. The development of China-UK relations is conducive to strengthening the cooperation between Hong Kong and the UK in economy and trade, culture and other fields, and would also promote the stability and prosperity of Hong Kong. The Chinese Embassy in the UK would continue to support Hong Kong to expand its cooperation with Britain and provide high quality and timely consular services and assistance to Hong Kong compatriots. Mr Lai briefed the Ambassador on the priorities of the Security Bureau of the Hong Kong SAR Government and his visit to the UK. He said that Hong Kong had enjoyed economic prosperity and long-term stability under "one country, two systems", which serves the fundamental interests of Hong Kong. The Hong Kong SAR Government is grateful for the consistent support of the Central Government and for the consular services and protection that the Embassy in the UK has provided to Hong Kong compatriots over years. He stressed that Hong Kong would use its unique strength to add splendor to the "Golden Era" of China-UK relations.